As a conservationist myself and a trained scientist I had for years given uneasy credence to the widely held belief that without hunting, huge areas of Africa would become wasteland and cattle farms among other things. I have always been against hunting for moral and ethical and ecological reasons but had bought into the argument, albeit reluctantly that hunting kept large tracts of land available for wildlife, which would otherwise be used for other, worse (from a conservation viewpoint) endeavors. Upon asking myself why I had, for so many years, accepted the use of large parts of our wild areas for what I considered to be an intrinsically unethical and amoral pursuit I came to the conclusion that I had done so out of fear! The fear of what would happen to that land and those animals if hunting was banned. And I had to ask myself – Is fear a good enough reason to support hunting in Africa and the answer was a resounding NO! I would like to challenge all conservationists in Africa who have supported the hunting industry (and there are many among you whose views on most things ecological I admire greatly) to ask yourselves whether or not you have given the same uneasy support to the hunting industry for the same reason. Now fear is never a good reason to do anything and there is a challenge here – as conservationists – if we have supported the hunting industry out of fear of the alternatives, we need to start work-shopping and brainstorming and coming up with alternative ideas for how to use that land, that benefits wildlife, in ways that hunting never will. Can we do conservation in these areas better than big game hunting has until now? As Ian Michler mentioned in an article written for Africa Geographic, There are a few recent studies that have been done that conclude that the trophy hunting industry makes an insubstantial contribution to GDP, job creation and local economies in African Countries. One report compiled about two years ago by the IUCN and titled Big Game Hunting in Africa is Economically Useless concludes that “hunting does not however play a significant economic or social role and does not contribute at all to good governance. This study goes on to state that of the eight main big game hunting countries in Africa, 16,5% of the land is set aside for hunting purposes but it only contributes to 0,0001% of jobs in those countries. How can we conserve this 16,5% of land better than hunting? Ecotourism is the obvious alternative and in that same IUCN study quoted above, it was stated that across all the investigated countries, the trophy hunting revenue was only 1.8% of tourism revenues. So this begs the question – Have we explored all the ways in which ecotourism can operate and contribute to the economy and to conservation. I don’t think we have, and I think that as conservationists, we need to start thinking out the box here, to come up with new and innovative ideas to explore ecotourism. And are there any viable alternatives other than ecotourism? The next problem with the hunting industry is the corruption and illegal shenanigans that often go hand in hand with it and the evidence is stacking up. Professional hunter Peter Thormahlen was hit with a “token fine” in 2006 for illegally hunting a rhino (on behalf of a Vietnamese client), before he was brought to court again two years later on identical charges. It is worth noting that Thormahlen’s rhino hunts have frequently taken place on Mauricedale Game Reserve. Professional hunter Christaan van Wyk had already been twice convicted of rhino horn offenses when he was found guilty of illegally hunting a rhino (also on behalf of his Vietnamese client) in 2010. Prior to the 2011 arrest of professional hunter and game farmer Hugo Ras for unlawful possession of scheduled veterinary drugs and an unlicensed firearm, he had thrice been fined for assault and “crimeninjuria” convictions, as well as for contravening conservation and customs laws. Suspected syndicate mastermind Dawie Groenewald’s criminal history is remarkably extensive — including a long list of international complaints, lawsuits, and criminal allegations and convictions — and far pre-dates his 2010 rhino-related arrest. Among other things, he was terminated from his job as a police officer for involvement in an organized crime ring that was smuggling stolen cars into Zimbabwe and also has a felony conviction in the US for unlawfully importing a leopard trophy (a violation of the Lacey Act). Let’s not forget to mention the “Boere Mafia” — an unsavory gang of safari operators, hunters, game farm and lodge owners (allegedly) masterminded by Saaiman Hunting Safaris owner, Gert Saaiman, and Sandhurst Safaris owner, George Fletcher, along with Frans van Deventer. Despite (allegedly) organizing the killing of at least 19 rhinos in national parks and on private game reserves, and facing multiple charges (including racketeering, money laundering, various counts of theft, malicious damage to property and contraventions of the various provincial Conservation Acts and the Aviation Act), they walked free in 2010, when their case was “struck from the roll”. In August 2012, TRAFFIC published its extensive report (The South Africa – Viet Nam Rhino Horn Trade Nexus), which noted that South Africa’s “high-profile private sector individuals” consistently evade justice. None of these individuals has yet been convicted and punished, but the outcome of these cases could be pivotal for the future of South Africa’s rhinos. If convicted, and given prison sentences commensurate with what has recently been imposed upon Asian nationals, others in the private sector may be deterred from becoming embroiled in the illegal rhino horn trade trap. And in July 2013, an investigative report by Fiona MacLeod and Estacio Valoi revealed that South African trophy hunters are operating a rhino horn trafficking ring out of Mozambique. The kingpin is said to be “safari outfitter with a hunting concession close to Corumana dam” who pays bribes to the local police chief to have charges against his operatives dropped. Other hunters fingered in the investigation since 2011 include a safari outfit previously caught luring lions out of the Kruger for “canned” hunts, and another outfit previously implicated in ivory smuggling in Namibia. The hunting Industry can also be pulled apart as far as lion hunts go. There are numerous stories, some with accompanying evidence and some not, but credible nevertheless, of professional hunters luring lions out of protected areas and onto hunting concessions where they can then be “legally hunted’. How are these hunters still operating and how can we sit back and accept this kind of behavior from the hunting industry? There are stories of drugged lions being shot, stories of completely tame lions that had been hand reared and treated as pets by individuals in the canned lion industry and then given over to be shot by some unsuspecting or ethically challenged hunter. These canned lion operations often dupe innocent (and sometimes not so innocent) tourists into paying money to get their photos taken with lion cubs. The money from this goes towards feeding the lions that are used in the hunting industry and this part is often not advertised to the tourists, along with the fact that the little lion cub that they are fondling and petting today will be the canned lion trophy on some rich hunters’ wall in seven years’ time. I sat watching a debate on eNCA channel 403 0n DSTV on Tuesday night where the chap arguing for hunting stated that canned lion hunting was acceptable because it was better than the alternative of hunting wild lions, and while I can’t dispute that the hunting of wild lions is horrific and creates all kinds of well documented problems for lion populations in the wild I have to ask myself – Just because canned lion hunting is the lesser of two evils, does this make it acceptable. And the answer is a resounding NO! For all the reasons stated above and many more. And I challenge all conservationists reading this to ask themselves whether we just sit down and accept canned lion hunting because it is the “lesser of two evils”? Now don’t get me wrong, I am not some naïve bunny hugger. I understand that shutting the hunting industry down in this country comes with all kinds of baggage. It is not something that can just happen overnight and everyone lives happily ever after, but again, is that a reason to then say, Oh it can’t be done, it is too difficult - or should we be challenging ourselves to look for ways of doing it and coming up with a workable plan and process. As soon as their lions have no more monetary value, what is stopping these “farmers” from letting all their lions starve to death in their cages, or shooting them all in the head right then and there. This is a very real possibility and any solution needs to bear this in mind and have a plan in place to prevent this from happening. And this is just the tip of the iceberg, but again I say to the conservationist’s among you, just because it is going to be hard and there are going to be problems, is it fair to say, rather let it continue. It is easier. I think that as conservationists we have been burying our heads in the sand on this, hoping the problem will go away, or pretending it doesn’t exist and carrying on with our own conservation projects in the belief that we are doing what we can in other areas of conservation so we can just let the “hunting issue” be swept under the carpet. I think that the time for sweeping under the carpet is finished and I challenge all Conservationists in Africa, young and old, experienced and not so, professors and students, to start shifting their paradigms, challenging their beliefs and working together to come up with a workable and better alternative to Trophy Hunting in our beautiful country. Thank you for your open letter and also for having the courage to expose the facts of hunting. When I was advising the Zambian Government, I was faced with a dilemma like you describe. A large area alongside a national park could either be put across to hunting or it could be put to agriculture. The area in question was not suitable for eco tourism. It had too many tsetse fly, no infra structure and no camps. If placed under agriculture, the habitat would have been destroyed. Under hunting, the habitat remained intact. I voted for a hunting concession. On the area in question, a hunting outfitter was granted the concession for an annual fee. The hunters lured lions and leopards out of the park with baits and recordings. They overshot their quotas on rare species like sable. South Africa has taken hunting to a new level of cruelty with canned lion and tiger hunting in most of the provinces of South Africa. With Botswana and Zambia banning hunting of big cats, canned leopard hunts will shortly become the norm, joining the lion and tiger canned hunts. I have watched the Melissa Bachman debate with interest. It reminds me of a TV programme I saw which interviewed serial killers. The serial killers admitted that one of the things they craved most, was fame and recognition. Once they were arrested and could tell their stories, they had the ability to shock the world. They became instant household names across the globe. It's the same with Melissa Bachman. Every picture that is posted, every article written, every piece of hate mail she gets, increases her notoriety. For Melissa Bachman, it's clever marketing and good self promotion to fuel her giant ego. There is a good chance that she took a canned tiger, but cannot show the picture because it's illegal. Where I stay in the province of the Free State, is the centre of canned lion and tiger hunting in South Africa. Therefore to all conservationists I say, deal with what you can affect. Help Maxine run down what is possible, don't be sidetracked by Melissa Bachman. We want to know what has happened in the Thormahlen case. Is Mauricedale Ranch still operating hunts? What has happened in Christiaan van Wyk's case? What is the latest in Hugo Ras and Dawie Groenewald's court case? Is corruption rife? Are officials being bribed to get them off court appearances. Is there clever lawyering? Marnus Steyl is another who's case has gone quiet. Investigate Gert Saaiman, George Fletcher and Frans van Deventer. Help Maxine probe these cases. We as South African citizens have a right to know. Send Maxine's letter to the Minister of Justice and senior prosecutors. Send it to senior members in the opposition parties. Keep probing, there is plenty of dirt. Keep feeding the media with facts and figures. Don't let these cases die! Make the Government aware that these cases are being watched and we want answers! Chumlong Lemtongthai, the Vietnamese rhino horn trader has been given a 40 year jail sentence, we want more heavy sentences!! Please get off the fence and help Maxine and good luck to you all. My last newsletter, which was about communication between two rival tigresses, has caused some indignation amongst the animal communicators and I have been wondering why. People who can converse with animals, are relatively new. Hunters, photographers and scientists have been around for a long time. Many layman are skeptical about whether some people can talk to animals. Many visitors to Tiger Canyons ask me whether it is true. Clearly animal communicators have a way to go before they can convince the public. I have been fortunate in that I spent 14 years with the mother leopard. For 5 of those years, I slept on my jeep. When she moved, I moved, when she slept, I slept. The mother leopard's granddaughter Manana, died of natural causes at 16 years old. At 4 years old, I saved Manana's life and those of her cubs when I treated her and her cubs for sycoptic mange. Twelve years later, she repaid the favor by taking me hunting with her for 3 hours. Three of the most magical hours of my life. I was with Shingalana the lioness, for 4 years and when she died I was devastated. Her death was as severe as losing a close family member. I hand raised the leopards Jamu, Little Boy and Little Girl and released them into the wilds with varying success. I have returned 5 cheetah to the wilds and now have the opportunity of returning another 4 back to freedom. As I write this, Tigress Julie, 14 years old, is fighting for her life. Every minute of every day, I am communicating with her, urging her back to health. You could say therefore that the opportunities I have had to communicate with cats are immense, better than most! Therefore, can I converse with the cats that I film and photograph daily? No I can't! I remain a layman, but well satisfied with the spiritual journey I have traveled with each and every cat I have been touched by. As humans we love to glorify. Elvis Presley and Michael Jackson were gods of rock and roll. We become disappointed when we discover that in fact the gods are human and are like us, deeply flawed. Therefore it is always interesting to me that the animal communicators request to talk to Corbett and Julie, the two best known tigers at Tiger Canyons. Why not Seatao, Sunderban or Mahindra? Is it the fame or notoriety of the tiger that they seek? Is it in the tiger's interest or is it personal promotion, I wonder. Over the years I have had to answer hundreds of thousands of questions from guests. Some questions are challenging, some are personal and some are stupid. There are many conversations that I would prefer not to have. It is the same with tigers. Therefore the question you should be asking is not "can I speak to Corbett" but rather "does Corbett want to speak to me". Tigers have great powers of deception, therefore if it's a conversation the tiger does not want to have, how do you know you will get the right answers? Several animal communicators have spoken to Corbett. All have given me different versions. All have glorified him. None have picked up that I have saved his life on at least two occasions. Once when Seatao was beating him up and another when Sunderban had him cornered. No animal communicator has told me of the time when Dr Charlotte Mouiex sewed Corbett's nose back onto his face after he was stabbed by a blesbuck. I have had my own communication with Corbett and it is simple. "You turned your back, you didn't see me in the grass, I hunted you and nearly killed you. If you do that again, I will kill you"
Likewise the animal communicators that talk to Julie, the Princess Diana of all tigresses. The communicators all came back with good things. 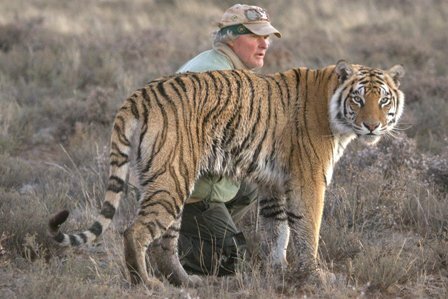 The love, the joy, the ambassador tigress, photographed, filmed and admired across the world. But Julie, like all tigers and all human beings is also flawed. Twice she had broken out, killing 17 and 14 sheep respectively. Julie abandoned her second set of cubs and she is the prime suspect in killing Shadow's cubs. In short, Julie has a dark shadow like we all have. Therefore as a wildlife documentary film maker, I believe it's my duty to tell the good, the bad and the ugly. I believe animal communicators have the same responsibility! Many different types of people visit Tiger Canyons. Those who want to hunt tigers, those who want to buy tigers, those who would to steal a tiger, those who film and photograph and those who would like to talk to tigers. Some of these people are clearly in it for personal gain and some are genuinely in it for tigers. Every day I spend my life assessing the people that visit. Like I do with tigers, I watch the body language, I look into their eyes, I assess their energy and calculate their motives. Then I take my decision. My advice to all animal communicators is this: You are at the forefront of cutting edge conservation, the new frontier. However, with your skill to converse comes responsibility. If you cannot read the animal, say so! If you are unsure, say so! If the news is bad, say so. If you are to assist laymen like myself who are facing tough decisions every day, then your communication needs to be accurate and honest. With bad information, I will take the bad decisions. If you tell me "I went out and sang to the hippo and all the hippo came and sang back to me" your credibility will be shot and you will be placed in the "lunatic fringe" where you belong. As I write this, it is 10 days since Julie had the terrible fight with Shadow. Dr Ryan Niemand has done a fantastic job in re-hydrating her intravenously and subcutaneously. Yesterday she took food for the first time in 4 days and I am hopeful for a full recovery. Thank you to all of you who sent good energy from around the world. It has been 45 days since I wrote to the Minister of Defence requesting help from the Defence Force in the rhino poaching crisis. To date I have had no reply. Thank you so much for sharing your concern about our rhinos and big cats. I really appreciated Maxine's thoughts on what is happening in South Africa with "canned hunting" and the criminal elements that seem to be able to bribe their way out of jail. I have never hunted myself, except with a camera, so I do not know why anybody would want to kill an animal, especially if it is not for food. I have also noticed that on "hunting farms" in the Free State, game reserves like Tussen-die-Riviere" or huge game ranches in Zimbabwe (like Lonestar near Chiredzi) THOSE ANIMALS ARE SCARED OUT OF THEIR MIND when you approach them in a vehicle, especially when I had a white double cab -- some kept running for at least 2-3 km, and I watched them running flat out all the way. So yes, I am 100% with you on that score. CANNED HUNTING = HORRIBLY WRONG! But there still remains a question in my mind, and I am not sure that most of us want to hear it, or think about it. But I will share it with you anyway. and 100% ACCEPTABLE to raise a trusting calf for milk or for slaughter so we can have Boerewors at our braai? Are we not perhaps victims of our own "set of priorities"? Who is to say that my meat craving is any more important than an Oriental's aphrodisiac/dagger handle needs? and does a rhino need any more special treatment than a cow that produces milk..
IS A CANNED LION HUNT ANY MORE NAUSEATING THAN A CATTLE ABBATTOIR? What is fit for the goose should be fit for the... lion… otherwise we are no more than bigoted hypocrites! Thanks for doing so much for nature conservation. I appreciate it. Linda Foley and those areas can still be conservation and preservation areas! Love it! Glen Malan A hunter is just a rich poacher. But maybe a hunter is even worse because they lust for killing other creatures who ask for nothing else than to be as they have always been. Lets the hunters hunt each other - it is the winning solution, JV. They get to indulge in their psychopathic "sport", their numbers surely won't decrease right? After all, that's the argument they use when they hunt Africa's wild life. We need a hunger games style method of hunting to be the norm for these pathetic people. Duncan Eva Every industry has bad apples ,to judge everyone as the same is irresponsible. The sustainable utilization model has allowed millions of hectars of land to be reclaimed for wildlife ,mostly through hunting. It might not be pretty but it works . Balancing ecological & economic needs is going to be the biggest challenge facing conservation . John Kinnaird Whilst I see all the arguments in the Hunting / ecotourism debate, I cannot but sense that John Varty and the SA Conservationists are living in a far better place than all the other countries to the North. The situation on the ground in Zim is that the wildlife has been decimated over the last 15 years. Former Private game reserves are devoid of wildlife, national Parks are hunting reserves for "Chefs" and ministers with their Chinese bankers. A warning to South Africans as a whole-- Protect what you have, and do whatever it takes to weed out the bad eggs in the game industry. Fight to put punitive legislation in place and involve the local people to ensure that they get a decent piece of the pie!! What you think you have for the long term can disappear in the blink of the eye. Linda Foley Sometimes you find yourself doing things out of fear until you grow and realize that something is wrong. That comes from evolving and thinking, two very good things. I know what you mean. Linda Foley Gordon Haber writes about the damage to the family unit of the wolf when the alpha male or female is killed or trapped in Denali Park. It is illustrative of how really damaging these kills are. Barbara Krause Thank you for an honest expose. So many things on board to consider.. interesting and informative..
Brigit Amberly hunting is wrong. period. fukk the fear of hunters. arm yourselves with assault rifles and help the wild animals shoot back at the hunters. that takes real courage, but that's what it will take since only wealthy elitists make up the majority of big game hunters in africa. Louise Joubert Finally the right words coming from someone that could use his knowledge and exposure to do what is so desperately needed. Karl Rosenberg Well done JV I support your thoughts, we have a country that is better than any other in the world and i know that hunting has its place, the question is where and how. As for the bragging when it comes to hunts we all know that the old days of horse back hunting and hiking are a bit of the past so any boasting in this day and age is questionable. We once met in the Sabi Sand very long ago when I was still working for Tvl Conservation Dept, doing game counts with Petri and Nick Zimbatis. Nevertheless, Maxines article stunned me because I also realized I supported Trophy hunting for the same reasons. I had the privilege to be "in control" of the section regulating Trophy Hunting in Limpopo for 7 years which gave me first hand insight into the real industry most people do not know. There are good people with good intentions but in the end the whole principle of hunting an animal purely for the pleasure and to put a stuffed mount on your wall to brag about is wrong and I don't believe we need that kind of money anyway. I subscribe to sustainable use principles and do not believe hunting canned lions of leopards helps to lessen the impact on our wild populations because in any event if you don't have a sustainable population of lion to hunt from in the wild you should not be allowed to hunt a lion. Yet authorities gave in and allowed people to breed lions and can hunt them simply because the did not have the guts to say no to a money driven industry. Some provincial MEC's actually condoned can hunting because of the money it generates for the province despite all arguments against it. I was the person who prosecuted Van Wyk in his last case for hunting a white rhino and was also the person who instigated prosecution and assisted the authorities in the USA to nail Groenewald there. I also charged Thormalen the last time he was in court and walked free due to incredibly bad prosecution. Thankfully I am now not involved with conservation anymore because its a farce in my view. I cannot be proud of being a conservationist while working for a government without guts. If Maxine wants to make contact with me I can talk to her and maybe fill in a few gaps on the issues she raised in her article. I recommend that both you and Melissa take 10 minutes to watch Allan Savory’s TED talk – download it, it is online, free. One can hug as many trees and bunnies, and save as many rhino’s as you wish, but without stopping desertification we all vrek. For her to advocate fewer cattle on the land, in the name of conservation, eish..
As always, a straight shooting and fascinating newsletter. Thanks for taking the time to write. I must agree, hunting should be banned. I lived in Kenya and used to hunt as a youngster and was encouraged to do so by my father who said if you cant eat it, don't shoot it. However things changed when I was 18 I obtained an old 4x4 (a decrepit DKW 2 stroke) we used it to go hunting. two occasions did not work well, the first was in the are of Lake Baragoi, where on hillside I shot an Eland. The problem arose as we could not get the 4x4 near to it and anyway it was far to big. The next thing that happened on another occasion my brother shot up a herd of Thompson's Gazelle, He had gone out in my vehicle and he had put a pile of dead animals on the back seat, drove home and left them there. I was away for few days when I returned there were dead buck rotting in (on) my little truck. I never went hunting again. About two years later I came to South Africa where I have lived ever since. 20 Years ago I returned to Kenya where I learned that the Government had banned hunting and what I saw was amazing. More Game and easier to see because the animals did not have big cowboys with big guns making big bangs all over the place. (someone told me they lifted the ban subsequently) for instance we saw leopards on the Mara which I had never seen before despite working there for a year. I have two sons who are now adults and I never encouraged them to hunt and they never have and they do not have dreams of being a big white hunter. I recently took a holiday in Zanzibar, obviously they cant hunt there but even then meat is scarce and most fishing is carried out by locals in wooden boats. There is of course big game fishing but it is so small that it hardly impacts the economy. It would seem that hunting has had its day..